A very high quality soy sauce, Healthy Boy brand, is now available. Chefs use this as a substitute for fish sauce, also used as a vegetarian subsitute for oyster sauce. Tastes just right with Thai congee (rice porridge). Naturally brewed from selected soybeans and mushrooms. Add a few drops to your soup or stir fry and enhance the flavor of any dish. Made using the natural fermentation method in a modern facility with ISO9002 certificate. Please see our feature story on how soy sauce is made. Ingredients: soybean, mushroom, salt water, wheat flour, sugar, sodium benzoate 0.1% as preservative. Glass bottle. Product of Thailand. Special Offer: 4 Pack. 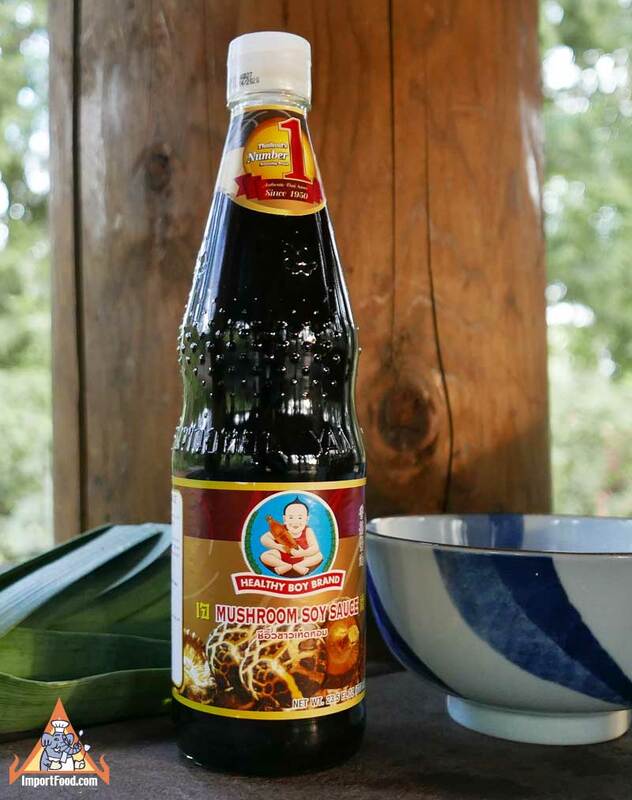 You get 1 bottle each: thin soy, sweet soy, dark thick, and oyster sauce. Delicious, warm soup for the heart and soul, this is an everyday meal that is often eaten by someone feeling ill similar to the way chicken soup might be used in America. In Thailand you can always find a street vendor offering congee, known in Thai as 'Joke' (taken from Cantonese language), early in the morning. This is often accompanied with Thai donuts. A similar recipe is khao tom which is not as thick as joke. Enjoy the pictures below as you can see a vendor making Joke the traditional way. Simple and delicious, and not only nutritious but also easy to eat so it's a fine remedy for someone feeling ill.